We frequently get calls and emails with questions about booking special events. We have tried to answer some of the questions below. We require a 50% deposit and a contract signed by both parties to reserve the date. Q1: What is your price and how do we book your band? 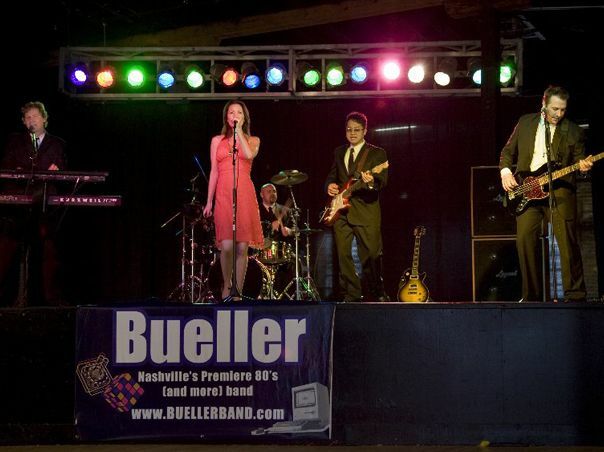 A: Bueller is cheaper than many other wedding or special event bands since we are our own booking agents and do not take a commission. However, we do occasionally book larger events through local talent agencies. Also keep in mind our quotes are usually much cheaper than the average wedding band nationwide! If you need an exact quote for your event, please email the answers to the following questions to the email above. 1. What is the specific date of the event? Is it peak wedding season or “off-peak” months, which are typically January through early April? 2. What is the address of the wedding or event? What is the name, address and size of the venue? Would it be an overnight stay from Nashville? 3. Are we providing sound equipment? How large of a space? 4. Are we providing stage lighting? 5. Are we required to learn new songs outside our typical setlist for the event? How many? 7. How long do you want us to play? What hours? 8. Will we be required to also MC the reception and/or DJ extra music? 9. Do you want us in formal dress or 80s costumes? 10. Do you want us to provide sound and/or music for the ceremony? Our quotes are usually anywhere from $2,300 – $6,000+ depending on if you’d like us to rent additional equipment, travel, learn extra songs, etc. 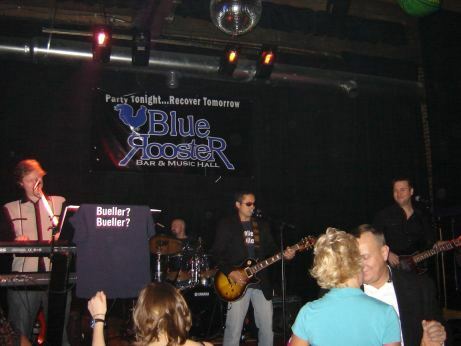 We are not (unfortunately) cheaper than a DJ because we are a live band! Plus, we like to think we entertain and interact with the crowd (taking requests) and make sure your guests are having fun! Here is a good article about how much a typical wedding costs. Here is another article about how much to budget for each type of entertainment. 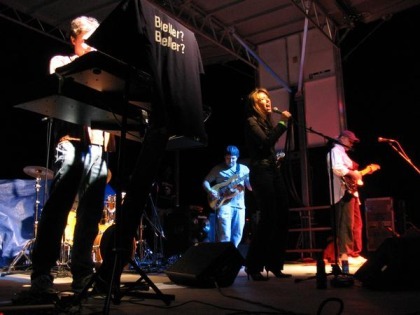 Here is a great article on whether you should hire a band or a DJ for your wedding or event. Some of the potential pitfalls of hiring wedding bands (most of our clients are not like this, but it brings up good items to think about). Q2: Can you provide references? What places have you played in the past? 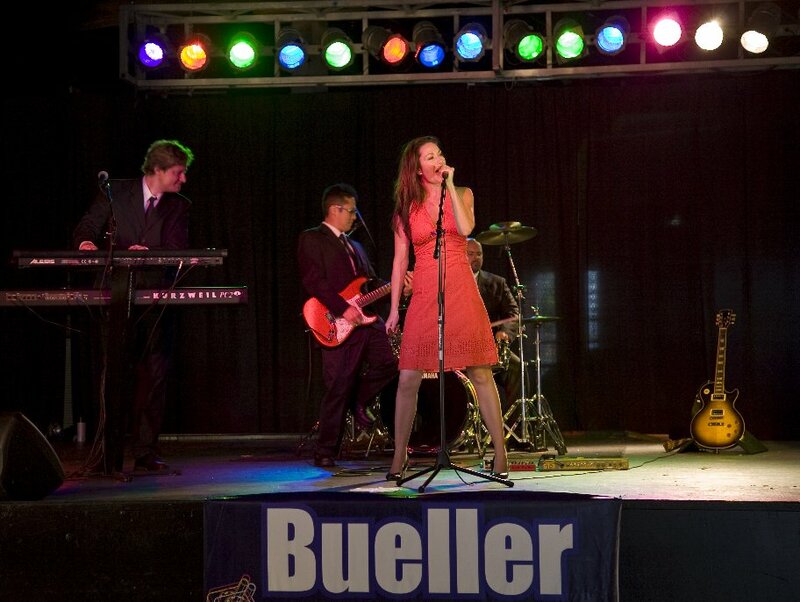 A:We have played hundreds of weddings and special events in the past. Click here for some of our references. We can always provide several more upon request. Click here for places we have played (located in middle of page). Q3: What should a bride-to-be look for when selecting a wedding band? A: Versatility is an important consideration. Not only should a good wedding band have a large degree of variety in their repertoire.The band should also be flexible enough to be able to perform at different volume levels appropriate for different times during the course of a wedding reception. They should be able to provide announcments if needed. Other factors to consider are reliability and stability. 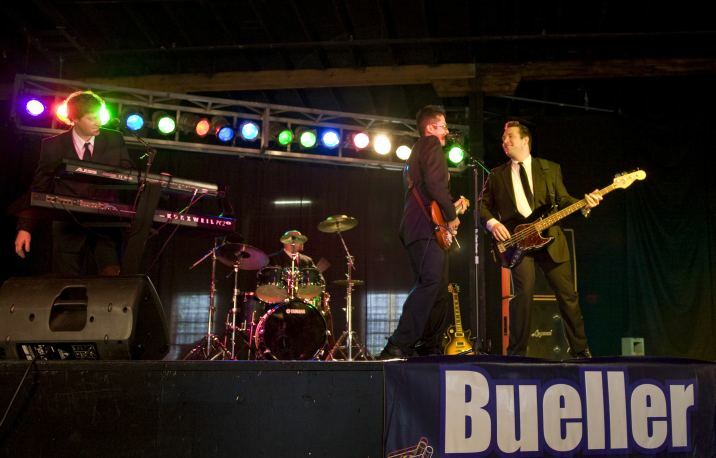 It is important to make sure that a band being considered for a wedding reception has been together for a reasonable amount of time with its current personnel. Hiring a band that has a propensity to change band members frequently is a situation that is best to avoid. Ask what clubs and weddings the band has played. Ask for letters of recommendation. Go see the band live. Dont trust a website video or recordings. Q4: Why is a band preferable to a DJ? A: There is no substitute for the excitement of a live performance. Ask anyone if they would rather listen to their favorite artist’s CD or see their favorite artist perform live. Perhaps the reason that many people prefer DJ’s over bands is the cost — or the fact that some bands are not diverse enough to adequately play the variety of music necessary for a wedding reception. Q5: Can certain songs be requested to play / avoid? A: It has always been our policy to encourage brides and grooms to provide us with a list of their special requests, as well as a list of songs they would like us to avoid playing. We will typically combine the bride’s request list with our own expertise in determining which songs would be the most effective to use at any given time during the course of a wedding reception. Q6: What sort of experience should a wedding band have? A: An experienced wedding band is usually well versed in the flow of events at a wedding reception. It is the band’s job to work with the function director and other professionals involved, in coordinating the different events that take place. For example, the band needs to make sure the photographer and videographer are informed before they begin the cake-cutting ceremony. The band will usually provide the bride and groom with a sheet to fill out indicating all of the announcements, special dance selections and other details regarding the order of events that will take place during the reception. The band will then oversee the affair to ensure a smooth transition from one event to another, allowing the bride and groom to relax and enjoy their special day. Q7: What size band should I hire? A: It is frequently believed that a 10-piece band will produce a “larger” sound than a 5-piece band. This is not necessarily the case. Talented musicians who work well together can often create a “larger” and better sound than bands that employ a larger number of musicians. What determines whether or not a band will have a “large enough sound” to fill a specific venue is inevitably the quality and power of the band?s sound system, and not the number of musicians in the band. Also, make sure the wedding band you hire plays around frequently and is not just a “front” band with website. Make sure you can go out and see them live before making your choice. Q8: What should someone ask their reception site in regards to the band? A: Frequently a bride-to-be will coordinate matters separately with the reception site and the band. This can occasionally lead to unforeseen difficulties on the day of the reception. We often recommend that a bride consult with both the reception site and the band in determining matters pertaining to the setup of the band. Where the band would optimally set up at the site is often a variable that can best be determined by consulting with both the band and function facility. Also, the floor plan mapping out the setup of the guests’ tables is something that the band can often be helpful with. We usually recommend that tables reserved for older guests be placed in areas that are not too close to the band’s speakers. Several of these details are also spelled out in the band’s contract with the client. Q9: How many breaks does the band usually take? A: During a four hour function, there are typically three sets with two breaks in between. The first break usually occurs when the main course is being served. The band then would play background CD/ipod music during the main course. 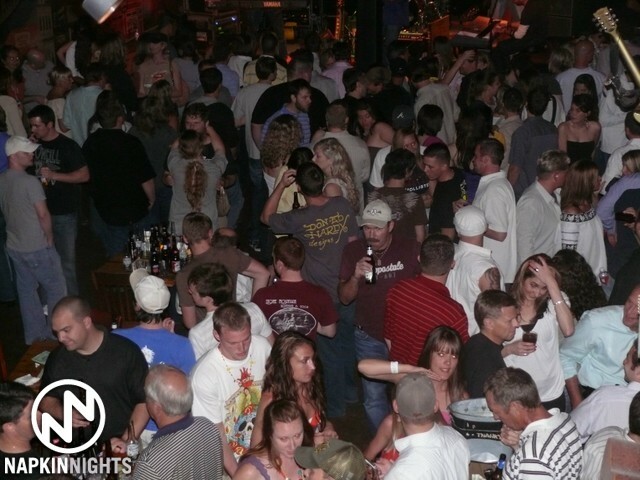 The second break typically occurs between the two dance sets, during which the band would play dance music on ipod to keep the party going. Q10: Any other tips someone should consider when choosing a wedding band? A: Don’t book soley on the video or website alone. Get recommendations. Read our testimonial letters. 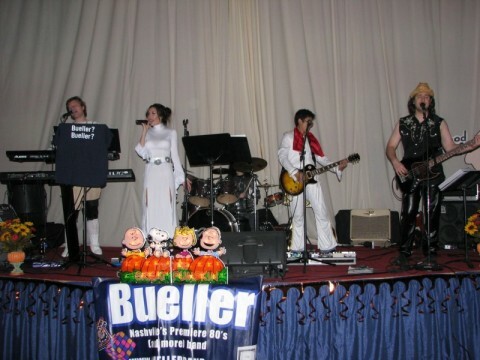 You can always come see Bueller live if you give us notice.